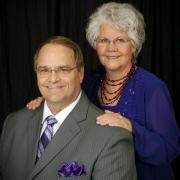 Pastor Curtis Harrington and wife Gail came to Buford Grove in August of 1995. For the first 30 years of ministry, Bro. Harrington served as Minister of Music and Associate Pastor of churches in Holland, Michigan, Connersville, Indiana, Bessemer City, Greensboro, Dallas, and Lenoir, North Carolina, and Jacksonville, Florida. He graduated from West Lenoir Baptist School of Ministry in Lenoir, NC in 1993, receiving a Bachelor of Divinity Degree. Pastor & Mrs. Harrington have three children, Shannon (Deborah) Harrington, grandchildren Daniel, Rosa, & Essa who reside in Nutley, New Jersey; Dawn (Doug) Colley, grandchildren Abigail & Jude who reside in Callahan, Florida, and Todd Harrington, grandchildren Isaac, Ethan, Amber, Braydon, & Kaddie who reside in Hilliard, Florida.